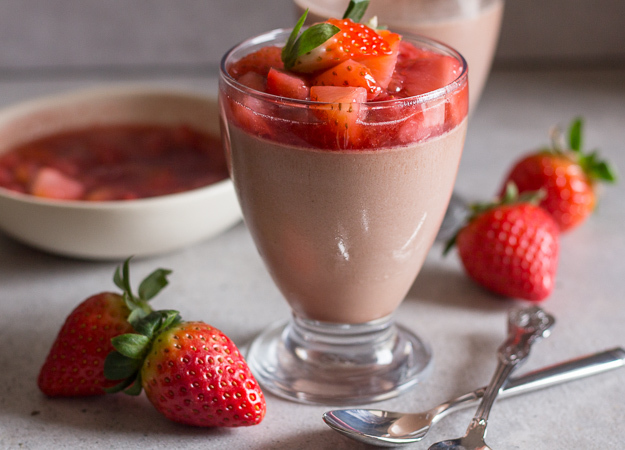 A rich, creamy and delicious Chocolate Panna Cotta topped with a fresh Strawberry sauce. 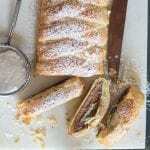 It’s the perfect easy anytime Dessert. The other day when I was thinking about what I was going to do for a Valentine’s Day post before it was too late and actually by blog standards, I am late! 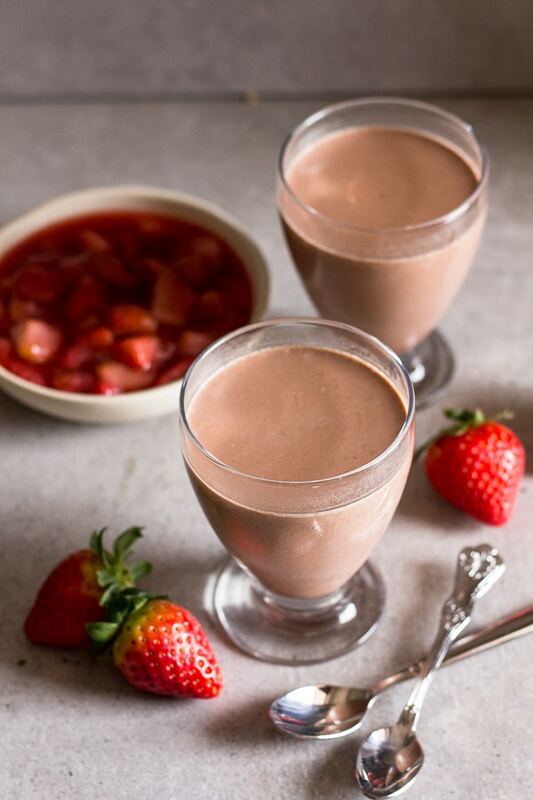 I decided a simple Chocolate Panna Cotta Recipe would be just the thing. Panna cotta is a sort of Italian pudding, made by combining cream and sugar, heating them with gelatine and then letting it cool. You then have the creamy delicious dessert. 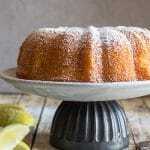 In a small pot add cold water and sprinkle in the powdered gelatine. Heat the cream and sugar just until you arrive at the boiling point. Pour into 2-4 glasses, depending on size and refrigerate for at least 8 hours or overnight. 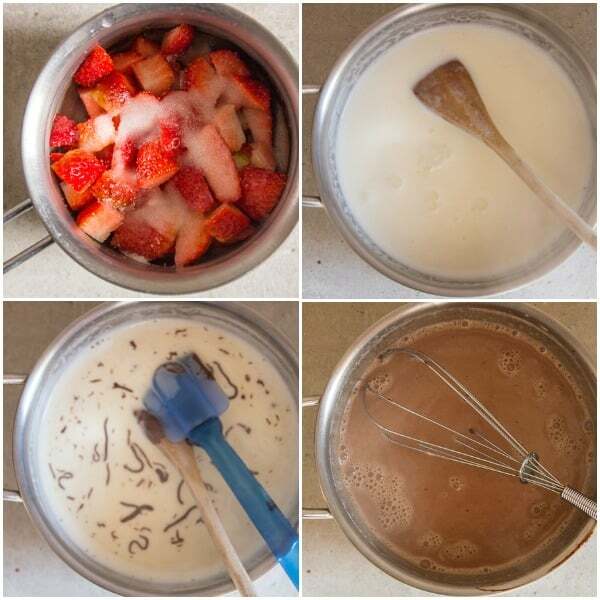 I decided I wanted to go with the old standby ingredients, Strawberries and Chocolate. When I first came to Italy I heard a lot about Panna Cotta but I really didn’t know what it was. So what is it exactly? Exactly what the translation means and that is cooked cream. At first I have to admit I really didn’t like the sounds of it. If strawberries aren’t your thing, then a simple Blue Berry Topping or how about trying a simple Caramel Sauce or even a Mixed Berry Topping. But just one taste and OMG it has got to be the creamiest, lightest dessert I have ever tasted. I also made a Panna Cotta Pie that is out of this world. Try it and see. Panna cotta can be kept in the refrigerator for 3-4 days at most, it should be covered with foil, or in an airtight container. 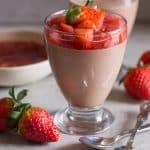 Chocolate Panna Cotta is such an easy dessert to make and when it is topped with a fresh strawberry topping it is the perfect special occasion treat. Enjoy! 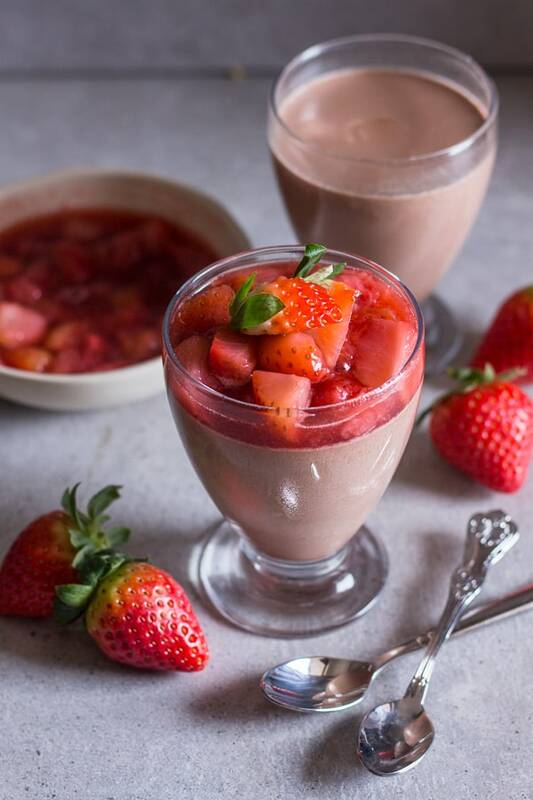 A rich, creamy and delicious Chocolate Panna Cotta topped with a fresh Strawberry sauce. It's the perfect special day Dessert. From Valentine's Day to Christmas and everything in between. In a small pot add cold water and sprinkle the gelatine on top, let stand one minute, then place the pot on low heat and heat until the gelatine has dissolved (1-2 minutes), then remove from heat. Melt chocolate either in the microwave or over a pot of boiling water. In a large pot add the cream and sugar, heat on medium / low heat just until the cream starts to boil, immediately remove the pot from the heat. Add the gelatine and combine, then add the melted chocolate and combine well. 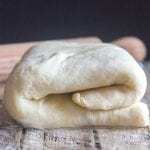 Pour into 2-4 glasses (depending on size) and refrigerate for at least 8 hours or over night. Top with strawberry topping before serving. Enjoy! In a small pot add chopped strawberries sugar and water, bring to a boil over medium low heat (stirring occasionally) until thickened. 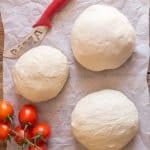 Let cool before using as a topping or refrigerate until using. Republished from February 3, 2018. This looks delicious! I cannot wait to make it. Hi Elizabeth, thanks I hope you enjoy it. Let me know. Have a great Sunday.